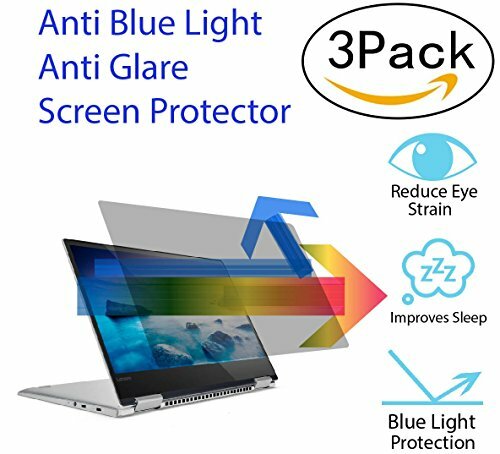 This Anti Blue Light and Anti Glare Screen Protector is designed to fit 13.3 inch Laptop with Aspect Ratio of 16:09. Please COMPARE YOUR SCREEN SIZE (TO THE IMAGE ON THE LEFT) BEFORE YOU PURCHASE TO ENSURE YOU GET THE CORRECT SIZE. Blocks 100% of Hazardous UV light and reduces HEV Bluelight up to 100% with excellent Color Transmittance. Anti-Blue Light blocking between 380nm~495nm for wide range HEV protection. Anti Glare Function, the matte surface can effectively reduce the glare of sunlight and UV emission from the LCD screen and reduce the visual fatigue. The package contain 3 packs of screen protector, one instruction and cleaning wipe for the screen. This Anti Blue Light and Anti Glare Screen Protector is designed to fit 13.3 inch Laptop with Aspect Ratio of 16:09. Please COMPARE YOUR SCREEN SIZE (TO THE IMAGE ON THE LEFT) BEFORE YOU PURCHASE TO ENSURE YOU GET THE CORRECT SIZE. Blocks 100% of Hazardous UV light and reduces HEV Bluelight up to 100% with excellent Color Transmittance. Anti-Blue Light blocking between 380nm~495nm for wide range HEV protection. Anti Glare Function, the matte surface can effectively reduce the glare of sunlight and UV emission from the LCD screen and reduce the visual fatigue. The package contain 3 packs of screen protector, one instruction and cleaning wipe for the screen. If you have any questions about this product by WS SCREEN PROTECTOR, contact us by completing and submitting the form below. If you are looking for a specif part number, please include it with your message.